After nearly six hours of voting the result has shown that 113 legislators were in favor and 104 were against the bill with three abstentions. The voting pattern followed four distinctive lines of thought, those who voted according to the popular will of their constituents, those who voted on personal beliefs, those who thought the bill is unconstitutional and those who voted on religious beliefs. Despite the overwhelming number of catholic leaders present at the gallery during the session period, the measure was approved by a slim margin. 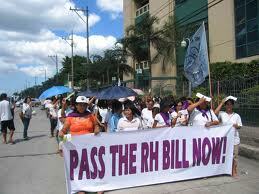 Most of the anti-RH legislators either voted on religious grounds or declared the measure as unconstitutional. Others meanwhile voted against the measure because they deemed it an unnecessary bill or a combination of the three reasons previously stated. 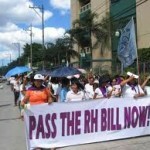 However, some observers say that the church pro life stance is only a ploy to mislead people of their true intention why they are against the RH bill. Others noted that the church is fearful that the passage of the RH bill would mean dramatic reduction in the long term for church income that comes from charity doleouts; services (baptisms, weddings, funerals, feasts etc. ); catholic run schools; hospitals; rentals from church owned commercial and real estate properties, once the population is effectively curtailed through artificial means with total support from the state. The church favors the natural method in the guise of morality. They specify,that it is the only method couples can adhere to without violating church rules, but they come short of acknowledging that their move actually complements their intention. Not known to many, the natural method in controlling birth is a total failure that is why the church highly recommend it for public consumption to protect Vatican’s vested business interests here in the Philippines, according to observers. During the session, at first, the measure was first put on ‘viva voce’ voting but the result was in confusion as anti-RH supporters in the gallery joined in the voice voting which led to nominal voting. The nominal voting started at 8:15 p.m.and took six hours to complete as lawmakers took turns in explaining their votes. The voting ended at 2 a.m. Thursday. There were 217 lawmakers who showed up for the historic vote but later counted 226 as late comers came in. HB 4244 now moves to the third and final reading, which will be tackled on Monday, December 17.